Tunisians are increasingly disenchanted with their nation’s leaders and institutions. Last year saw strong support for the country’s political leadership and the ruling political party, Ennahda. This year, however, public approval ratings for all leaders and most political parties have dropped. Many of the country’s institutions, such as the Constituent Assembly and the court system, have also lost favor. The Tunisian public gives overall low marks to the country’s leaders. Only former Prime Minister Hamadi Jebali manages to garner the support of a majority of Tunisians (58%). Still, Jebali’s popularity is down eight points from last year, when roughly two-thirds (66%) of Tunisians held a favorable opinion of the leader. Supporters of the moderate Islamist party Ennahda are significantly more likely (84%) to view Jebali positively than supporters of the secular Nidaa Tounes party (54%). Interim President of Tunisia, Moncef Marzouki, receives modest support from the Tunisian public. 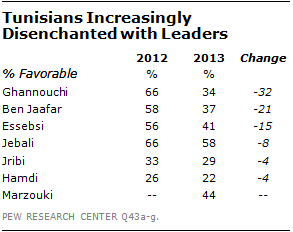 More than four-in-ten Tunisians (44%) view Marzouki favorably in his second year as interim leader. Tunisians who say a democratic form of government is important for the country are more likely to support Marzouki than those who say a strong leader is important (49% to 40%, respectively). Beji Caid Essebsi, former interim Prime Minister of Tunisia, is viewed favorably by roughly four-in-ten Tunisians (41%), while last year he was popular with over half of all Tunisians (56%). President of the Constituent Assembly and leader of the social democratic Ettakatol Party, Mustapha Ben Jaafar, is also considerably less popular. Over a third of Tunisians (37%) view Ben Jaafar favorably, compared to last year when a majority of Tunisians (58%) favored him (a 21 percentage point drop). The Tunisian public shows low levels of support for Ennahda party leader Rached Ghannouchi. Only 34% say they have a favorable view of Ghannouchi, down a full 32 percentage points from last year when nearly two-thirds (66%) of all Tunisians viewed him favorably. 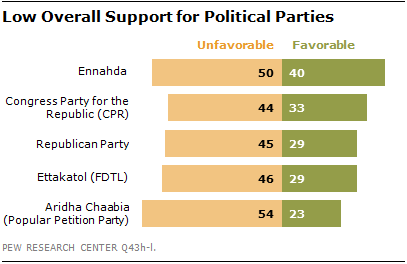 Supporters of the Ennahda party are much more likely (74%) to view Ghannouchi favorably than supporters of the secular Nidaa Tounes party (7%). Those Tunisians who say a democratic form of government is important for the country are more likely to support Ghannouchi than those who say a strong leader is important (39% to 30%, respectively). Maya Jribi, leader of the centrist Republican Party, also ranks low with the public, with just 29% of Tunisians viewing her favorably. Only 22% view Hachmi Hamdi, a journalist and leader of Aridha Chaabia (known as the Popular Petition Party), in a favorable light. Ennahda’s coalition partners have likewise fared poorly. Center-left leaning Ettakatol (FDTL) garners support from around three-in-ten Tunisians (29%), down from a modest but higher 44% last year. Just over three-in-ten Tunisians (33%) view Marzouki’s Congress Party for the Republic (CPR) favorably, a decline from 48% in 2012. There is low support for Aridha Chaabia (Popular Petition Party), with just over two-in-ten Tunisians (23%) viewing the party favorably. The Republican Party, a centrist party formed only last year, garners support from only about three-in-ten Tunisians (29%). On balance, the Tunisian public gives its nation’s institutions mediocre marks. However, two institutions still enjoy widespread support among the public: the military and the police. Fully nine-in-ten Tunisians say the military is a good influence on the country. This is down seven percentage points from near universal support last year (97%). Roughly seven-in-ten Tunisians (71%) say the police are a good influence. In addition to the military and police, the public still largely supports the media with nearly six-in-ten Tunisians (57%) saying the media is a good influence on the country. The Tunisian public has less positive views of religious leaders and the court system. Fewer than half of all Tunisians (44%) say that religious leaders are a good influence on the country. Support is higher among more religious Tunisians and those without a college degree: those who pray five times a day (51%) and those with no college education (46%) are more supportive of religious leaders than Tunisians with a college degree (33%) and those who pray less (32%). The court system also receives weak support. 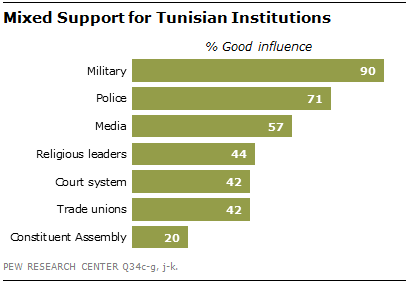 Only 42% of Tunisians say that the courts are a good influence on the country. Support for the court system is down 11 percentage points from last year, when over half of all Tunisians (53%) viewed the courts favorably. Trade unions have made gains with the public since last year, with around four-in-ten Tunisians (42%) now saying they are good for the country, up from 32% in 2012. Tunisia’s National Constituent Assembly receives very little support from the public this year. With Assembly debate on the constitution at a standstill, only 20% of Tunisians say that the body is a good influence on the country, while about seven-in-ten believe that it is a bad influence. 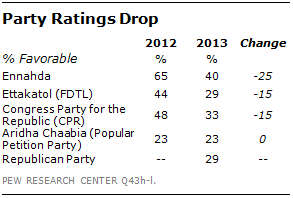 This is a 25 point drop in popularity from last year when 45% of Tunisians supported the Assembly.